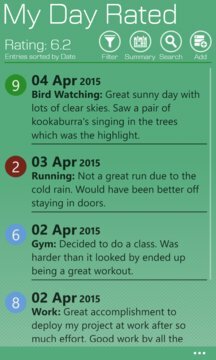 My Day Rated is a better way to record a journal of your day’s activities. With our smartphones with us at all times, you can now record your events and activities as they happen. Enter as many entries as you like from the categories that you define along with a rating for each entry. Designed with a simple and elegant interface, My Day rated is free, quick and easy to use. Best of all My Day Rated provides an overall rating as well as several reports that let you see which activities make you the happiest, which days of the week are your best and worst and which months are your most productive. Select the way to view and sort you daily journal list entries on the home page. Several combinations to choose from. Choose the one that best fits your needs. 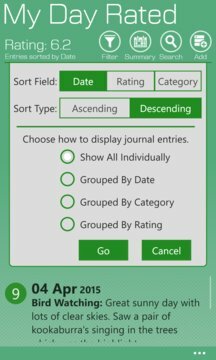 Create up to seven of your own categories to tag and categorise your journal entries for. You can Define the categories that are important to you. These categories will then be part of your stats. See at a glance a colourful summary of your journal entries by month on the calendar summary page. Includes a tally of your daily journal entries and average daily score. Great for tracking your best and worst days and seeing quickly any days missing a journal entry. Schedule up to three daily reminders to do a journal entry. Now you don't have to remember to do you daily journal entries! Password protect your journal entries to ensure personal journal entries can only be seen by you. Export your data to CSV for your own purposes. You can then use software like to MS Excel to view your journal data. Includes an optional live tile to that you can pin to show basic stats right on your phones home screen. Setup basic defaults to make common journal entries quick and easy by automating some actions.